Hi All! Today I have a fun little Father's Day card to share with you. 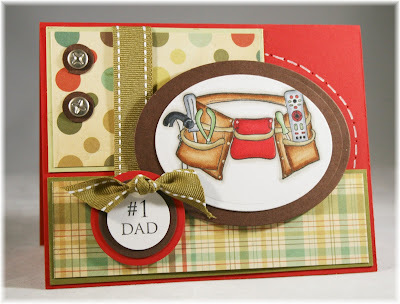 Since, that special day is just around the corner I want to have all my cards made for all the special men in my life. I pulled out my favorite Father's Day set *giggle* from Taylored Expressions. The set is called "Boys Will Be Boys" and it has images that will connect and relate to every man out there. I love it! The cool screw brads come in the Father's Day Key Ingredients. The layout is from this week's Taylored Expressions Cupcake Challenge. I love all of Taylor's sketches. Make sure to check out her blog for all the details on how to play along. Well, that's all for me but make sure to check back and see what fabulous new creations the other Baker's Dozen girls have in store. Love all the little details Ana! Beautiful stitching and great little brads there too!! LOVELY!!! Your dad will love this! terrific card, FAB coloring! love it. Fabulous card Ana! LOVE the white stitching and the way you added your sentiment...just awesome! Oh Ana! You are AMAZING! I have been just staring at this in WONDER! GORGEOUS GORGEOUS GORGEOUS!!! What a great manly card, Ana! I LOVE how the tool belt looks like weathered leather. . .awesome! This is just one awesome card. I just love the stamp set.